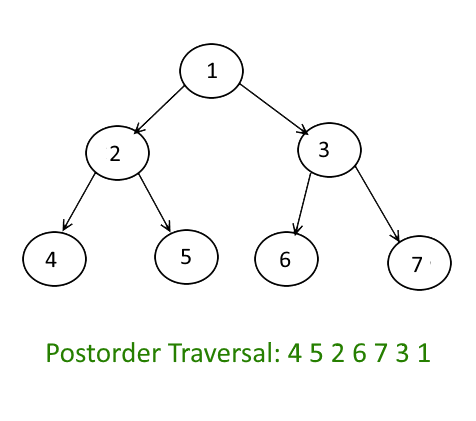 Objective: Given a binary tree, write a non recursive or iterative algorithm for postorder traversal. Earlier we have seen “What is postorder traversal and recursive algorithm for it“, In this article we will solve it with iterative/Non Recursive manner. We have seen how we do inorder and preorder traversals without recursion using Stack, But post order traversal will be different and slightly more complex than other two. Reason is post order is non-tail recursive ( The statements execute after the recursive call). So idea is follow the same technique as preorder traversal and instead of printing it push it to the another Stack so that they will come out in reverse order (LIFO). At the end just pop all the items from the second Stack and print it. Pop the node from Stack_One and push it into Stack_Two. Push the left and right child nodes of popped node into Stack_One. Pop out all the nodes from Stack_Two and print it. See the animated image below and code for more understanding. 240 queries in 0.142 seconds.